I plan on making our first Valentine's Day as a married couple a very special one. 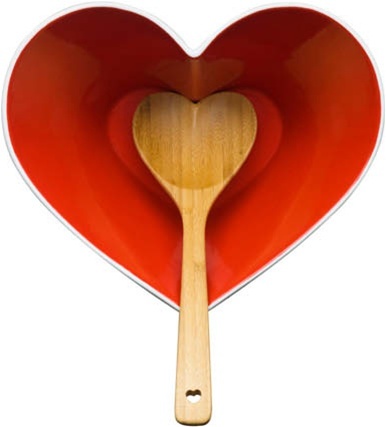 In the past we've always gone out for a special dinner, but this year I want to whip up a delicious meal for my hubby and serve it in this pretty heart bowl. What are your plans for V-day? p.s. I leave for Chicago this afternoon and I can't waittttt! I have a ton of things planned for my visit to the windy city, including drinks at Pump Room with some of my favorite blogging friends - Liz, Danielle, Lesley, Taylor, and Alex AND some shopping at my favorite Chicago boutique, Sarca! No worries - a weekend recap will be up next week and I promise to take tons of pictures! Have a fantastic weekend, luvies! That's such a sweet idea, and I hope you have a blast in Chitown. I am so jealous that you will be spending the weekened in Chicago. I have flown in and out of there multiple times, but have yet gotten to actually visit Chicago. Have tons of fun! I hope you and hubby have a very special first V-Day together. Bryan and I usually tend to cook something wonderful at home. This year we are making gifts for each other, too. Am I still invited to drinks tomorrow :) ? Can't wait to meet you!! Staying in and cooking is my kind of Valentine's Day! Have fun in my former hometown! I miss Chicago so bad it hurts. Yay! Happy First Valentine's Day as a married couple! Love the bowl! So fun! I'm really jealous you're getting to meet everyone there. I have to visit the windy city soon! Tell everyone hi for me! that bowl is too cute! have so much fun at pump room - great drink spot!!! this is so cute! have a blast! Have a great time in Chicago! Can't wait for your recap! Love this bowl! You are going to have such an amazing time in Chicago. The Pump Room is fabulous! The Pump room is amazing!! This is such a cute bowl!! Hope you have a wonderful time in Chicago even with all our crazy snow! Have fun! Can't wait to hear all about your trip! This is great! I especially love that spoon. Enjoy! Love this! Too cute! Beautiful blog, I am now following you too! Have a great Valentine's Day!